There’s a genuine sense of grief and anger in this Bruceploitation offering, made only three years after Bruce Lee‘s sudden and mysterious passing. This explicitly links Lee’s death to Triad drug pushers and sends Bruce Li out to investigate. 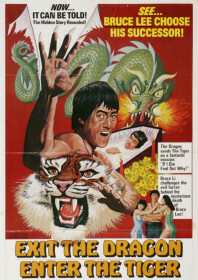 He plays David – Lee’s close friend and kung fu student, not to mention an idolising lookalike – who lands in Hong Kong during a media storm to find the film star’s mistress, called Suzie Yeung (a cipher for Betty Ting Pei), being harassed by crooks over evidence which suggests using Bruce Lee as an international drugs mule. The film essentially uses Lee’s death as motivation for a spot of crime-fighting, but the vengeful, embittered pummelling of the gangsters at the heart of the film could also be read as a cathartic exercise in providing a sense of clarity and closure to Lee’s untimely demise. Its complete lunacy, obviously, but satisfying nonetheless, culminating in a mammoth, dramatic fight between Bruce Li and Chang Yi against a backdrop of jagged rocks and crashing waves. AKA: Bruce Lee – The Star of All Stars.